Yesterday, Psy and Snoop Dogg released "Hangover," a new song and accompanying video about the struggle everyone faces after a long night of drinking. As you might expect from the two lovable goofballs, it is batshit crazy. Over a frantic saxophone-led beat, the pair holds forth about "[drinking] 'til you're drunk" and "making bottles pop until the wheels fall off." 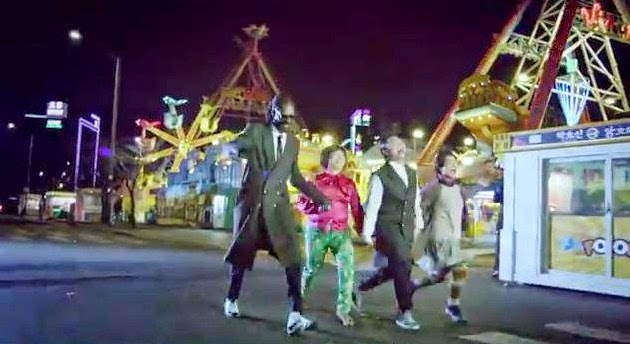 The video is typical Psy cartoonish excess: motorcycles, pools of ambiguous yellow liquid, food fights, a dude on fire running around in the street. By my count, the titular word is uttered something like 35 times in the song's hyperactive first two minutes alone (it's about five minutes long). For all its talk of hangovers, this thing would sound terrible if you actually had one.